Specifically designed for use on fire equipment. ROADBLOCKSâ¢ All-Terrain Urethane Wheel Chocks comply with NFPA 1901-09 and meet SAE-J348 standard for up to 32" and up to 44" wheel diameters. These tough, damage resistant, polyurethane chocks are resistant to oils, fuels, and solvents. 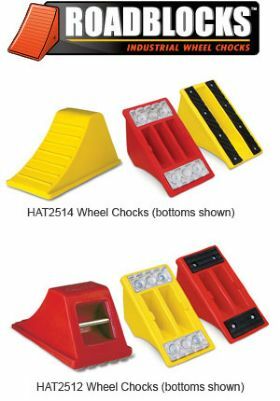 They also feature high strength, replaceable aluminum base plates with posi-grip traction cleats or anti-slip rubber traction pads. For added safety and convenience, Checkers incorporates a molded carrying handle and high visibility colors for easy identification. Mounting brackets are zinc plated. Hardware not included. FOB Shipping Point.